It’s no secret, I adore CinDwood looms. I’ve been designing patterns using Cindy’s ½ inch gauge looms for five years, and they are my favorites. But, before I fell in love with the ½ inch CinDwood, I designed on the Purple Knifty Knitter Hat loom. Why? It wasn’t the usual ¾ inch gauge loom. It was a 5/8 inch, and that small change in gauge made all the difference. When Provo discontinued the loom, I, along with many other loom knitters, were very sad. When CinDwood began making their hat looms in 5/8 inch gauge by special order, I ordered a set immediately. The wonderful design and pegs of a CinDwood loom and my beloved 5/8 inch gauge. What more could a loom knitter want? Well, I can answer that question. The perfect loom. A CinDwood 48 inch Universal S Loom – in a 5/8 inch gauge. Loom knitter heaven. Why? Well, let me count the ways. 1. Pegs. 254 of them if you are working on a single rake (single sided) project, and 82 pairs for a double rake (double sided) project. 2. Adjustability. The “slider peg” lets you adjust the size of the loom to any size you would like, so you have every size loom possible. You may even work on several projects at the same time on one loom. 3. Color. This amazing loom comes with the pegs in two colors, marking which pegs pairs are used when loom knitting a double rake item. Easy and clever! 4. Gauge. I adore the 5/8 inch gauge, but for this loom it is particularly nice. If you have any trouble with your hands and find working in the S shape a little tricky, the 5/8 inch gauge provides just a little more room, and makes working a large single rake item much easier than smaller gauges. 5. Pegs. CinDwood’s wonderful peg, with their smooth surface and wonderful tops let your yarn slide smoothly over the pegs without the loops falling off the top. 7. Size. The loom is compact and lightweight. The length is about 18 inches, and the width about 10 inches. It fits easily in your lap. If you have been trying out the Edmunds Stitch Master Stand, it also fits nicely on the stand. 8. Sturdy. The base and pegs on this loom are sturdy and will not bow or bend when you load it up with a heavy afghan. It is not going to break or pull out of shape with a heavy fabric on it. There you have it. 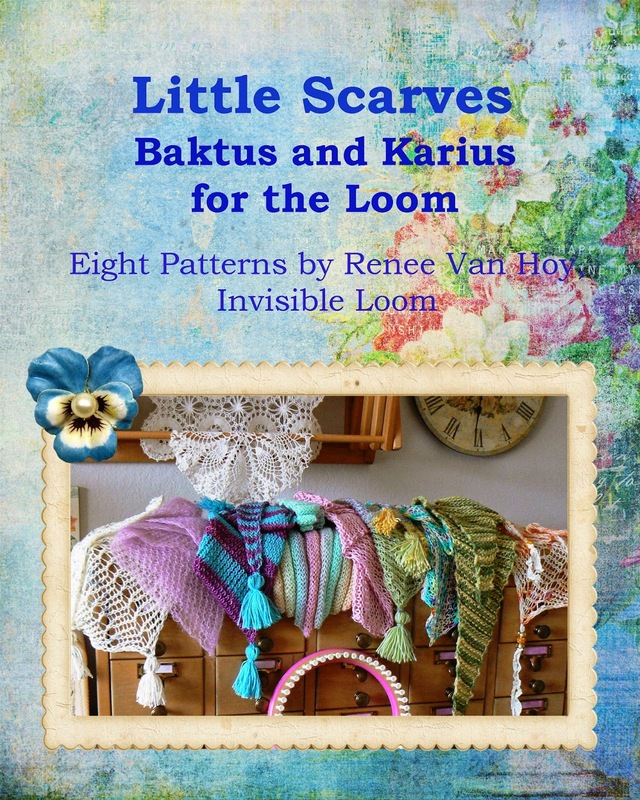 When we loom knitters talk about our perfect loom, we want adjustability, lots of pegs, sturdiness, a small size and a gauge that works with many yarns. I think the 48 inch 5/8 gauge Universal S loom fits that description. Copyright 2014 by Renee Van Hoy, Invisible Loom. All rights to content and photographs reserved. Do not distribute or copy in any form. It's Time for a Drawing! Congratulations to all the winners! Watch for an email from me to get your addresses. Our good friends at CinDwood Looms need your votes to help them get a grant to expand the business. You can vote here. Copyright 2014 by Renee Van Hoy, Invisible Loom. All rights to text and photographic content reserved. Do not copy or distribute in any form.